Can't believe this is my third post in three days, or that I have actually made three more cards - I sometimes struggle making cards, much more fun to get the paints out. 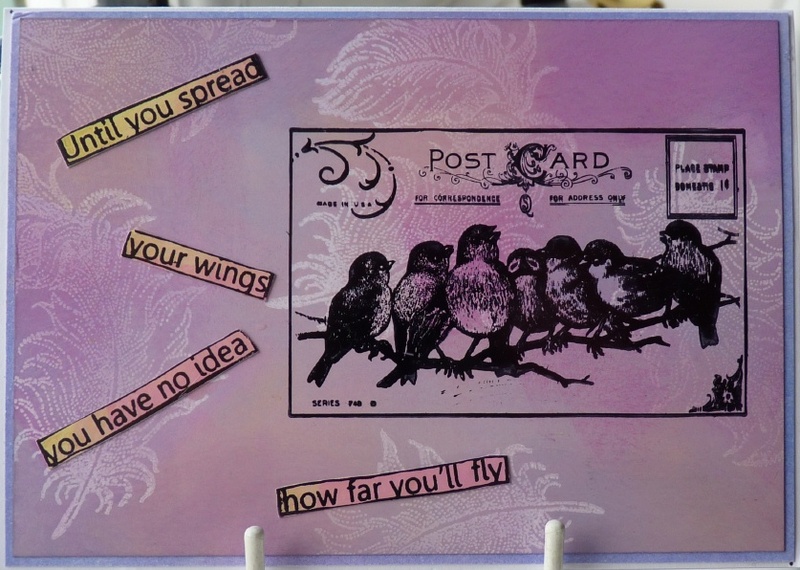 First two use the same feather stamp (Clarity) stamped in Versamark on Clarity card but different approaches to adding colour. 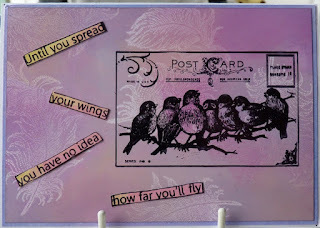 This one uses a combination of Distress Inks and stamps from Crafty Individuals (bird) and Dylusions (words). I used Pan Pastels over the Versamark on the next one. 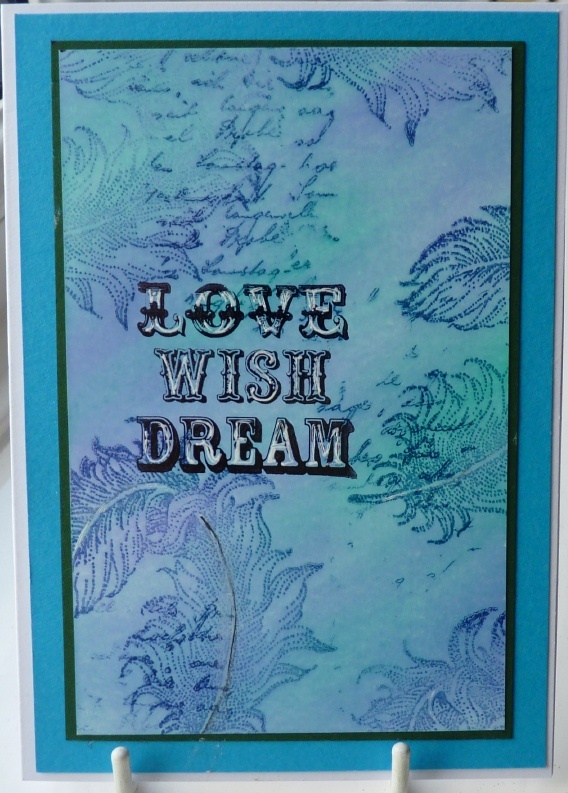 Not used these on coated card before but I like the softer colour you get on the background. 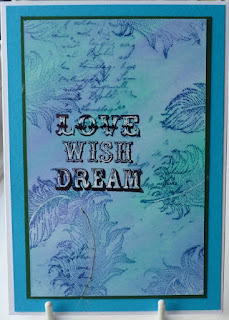 Word stamp is a Stampers Anonymous highlighted with white pen. Different approach to the next one as the background came from my box of bits. 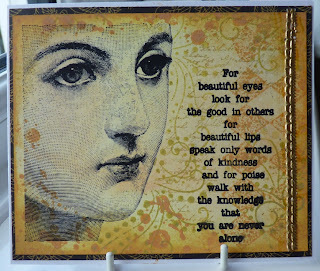 Overstamped with a variety of stamps in yellowish tones of DIs and Brilliance. I used my new Stampers Anonymous face as the main image. Looking forward to tomorrow as it is our monthly craft club and I haven't been for a couple of months. My bag is all packed and I have my ATC ready for the swap. Not looking forward to the fireworks this weekend though, Sorrel hates them and spent all last 5th November weekend under the chair for three nights - wouldn't mind if it was just one night but it goes on, and on. We bought a CD of firework noises and a DAP diffuser (supposed to help). She totally ignores the CD when it is on but jumps a mile if a real one goes off. Maybe it will rain all weekend and keep the noise down - or is that just me being a misery-guts. Whatever y ou are doing, hope you have a good (and a quiet) weekend. Beautiful cards, Ann. Love the colours of the second one. 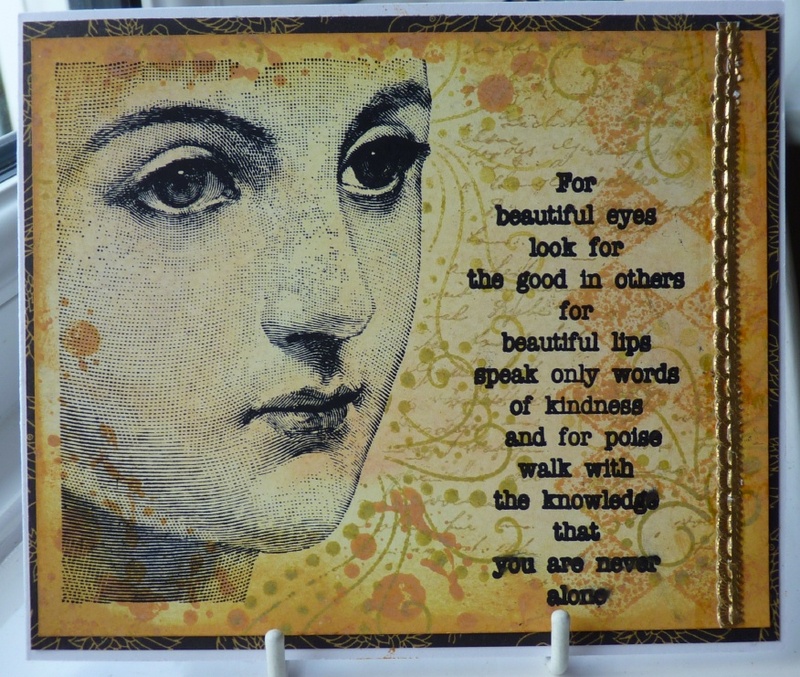 haven't you been busy and great cards, the face stamp is lovely. I keep hearing about Pan Pastels, they do lookm very subtle, but I donr think I can justify any more crafting expenses at the momentand knowing me I would have to get the whole set. What's On Your Workdesk Wednesday - 181?